A couple of weeks ago, in the midst of finding our new apartment, Jason’s brown ale reached maturity. 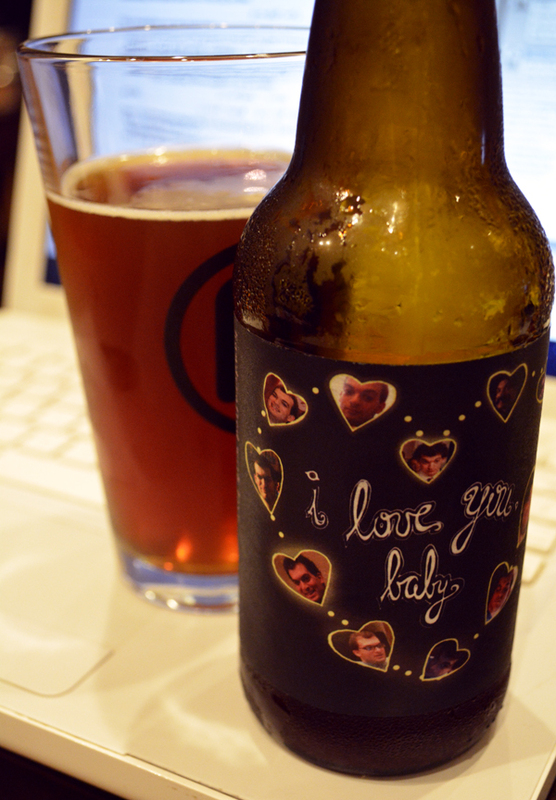 I sent him text message after text message hounding him to name the beer, which eventually resulted in him misdirecting a text to me saying, “I love you, baby.” We decided this would be an outstanding name for the beer, and Colleen set to work designing a label. Meanwhile I set to work planning a pizza pairing. To complement nuttiness of the victory malt and the slight roast of the brown and chocolate malts, I decided on gouda and roasted red pepper for toppings. I also happened to still have some of the grains I’d recovered from that brew on hand. I turned them into flour and made a 50/50 mixture with bread flour for the dough itself. This turned out to be too much contribution from the spent grains, as the dough was very dense and inflexible. Despite including plenty of yeast in the dough, it failed to rise at all due to lacking any kind of elasticity. When it came time to make the pie, the skin had to be stretched with a rolling pin just to get it thin enough. The pizza ended up similarly dense, though with good flavor and not entirely objectionable texture. 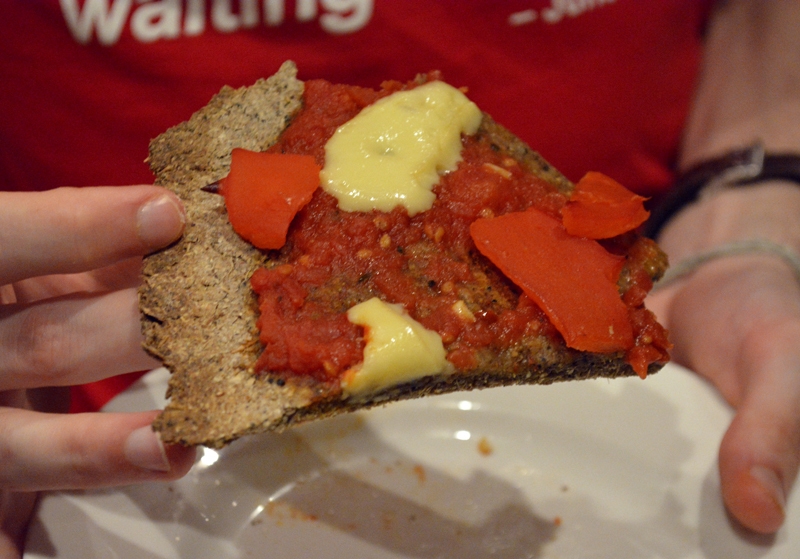 It was sort of like a cross between a thin crust pizza and a granola bar. I think it was saved by parbaking the crust to deprive it of some of its tightly held moisture. I also didn’t quite hit the mark I was aiming for with the beer. In fact I wasn’t even particularly close. Appearance: Good clarity. A sort of caramel color, with some ruby-like coloration in the light. To get any head on the beer, it takes a very aggressive pour. What head there is vanishes quickly without lacing. Mouthfeel: Medium body with appropriate level of carbonation. Aroma: Strong toasted malt character. Smells somewhat crackery. The aroma is very familiar, but I can’t quite place it. Perhaps something like a campfire. Flavor: Taste follows the nose. Strong toasted grain, leaning into woody. Lightly astringent, biting at the sides of the tongue. Virtually no sweetness or hop character. 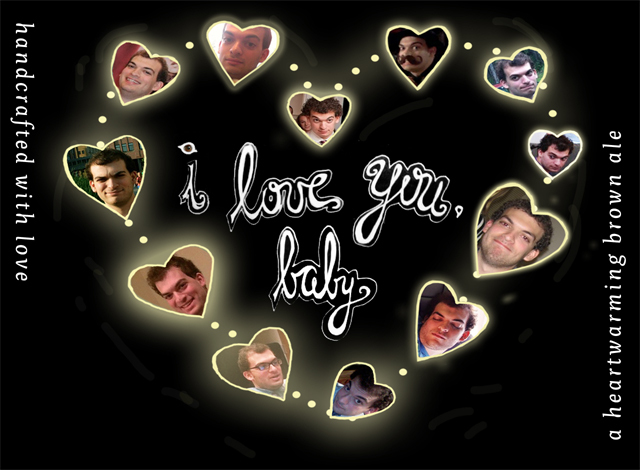 Overall: I’m not thrilled about how this came out. I think omitting any kind of crystal malt was a mistake, and I definitely used too much brown and victory malt. I have read conflicting opinions about whether brown malt even belongs in brown ales. It slightly worries me that the only two brews I’ve made with dark malts have been astringent. Perhaps there is something amiss in my mashing. This entry was posted in beer, learning, pizza, tasting and tagged beer bread, brown ale, flour, pairing, review, spent grain on July 22, 2013 by Dylan Bargteil.